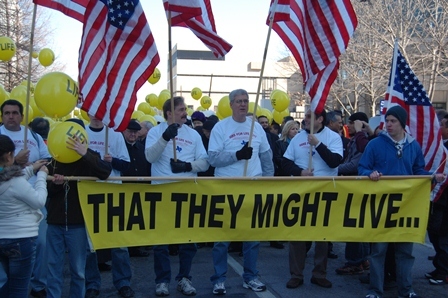 The 2012 Roe Memorial Events on January 21 were once again a remarkable day for Life, offering prayers for the 52 million lives lost to the tragedy of abortion and marching and rallying for a Culture of Life – this year with yellow “LIFE” balloons in celebration of the many victories over the past year. The morning began with a Jericho walk around Routh Street abortion center, with Bishop Seitz joining in prayer. During this time, an abortion-minded woman chose life for her baby! Following the rosary, the Roe Memorial Mass, attended by over 3,000 (overflowing into the Grand Salon and the Cathedral Plaza), was concelebrated by Bishops Farrell, Vann, Deshotel and Seitz, and diocesan clergy, with homilist Fr. Jason Cargo sharing his personal commitment to life. And at the close of Mass, and a parallel worship service at First Baptist Dallas, we saw an even larger crowd than last year marching and rallying for life outside the Earle Cabell Federal Courthouse. “You could ‘see’ in the crowd that sense of encouragement that we are winning, and there is so much more dedication than before,” said CPLC Executive Director and Rally MC Karen Garnett. 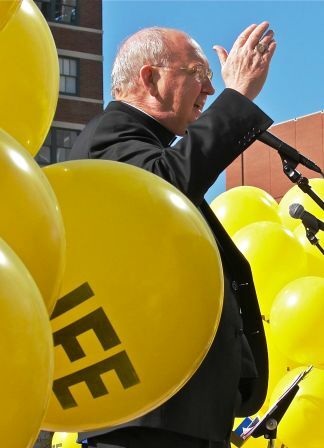 “We have the momentum, and we’re going to continue that momentum.” During the rally, Bishop Farrell challenged attendees to be activists for Life, not just on the anniversary of Roe v. Wade, but throughout the year. Bishop Farrell’s call to action was followed by the inspirational presentation of Dr. Barry Creamer (Criswell College) and the powerful testimonies of Lisa Luby Ryan of the “I Am Second” Campaign, former Planned Parenthood (Sherman) Manager Ramona Treviño, and Norma McCorvey – the original, now converted, “Jane Roe” of Roe v. Wade. 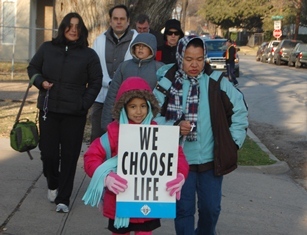 Visit www.prolifedallas.org/roe to view pictures and an inspiring video of the march and Bishop Farrell’s powerful remarks. And be sure to save the date for the 2013 Roe Memorial Events on January 19, as we look forward to our “exodus” from the desert that is the culture of death and legalized abortion in America.